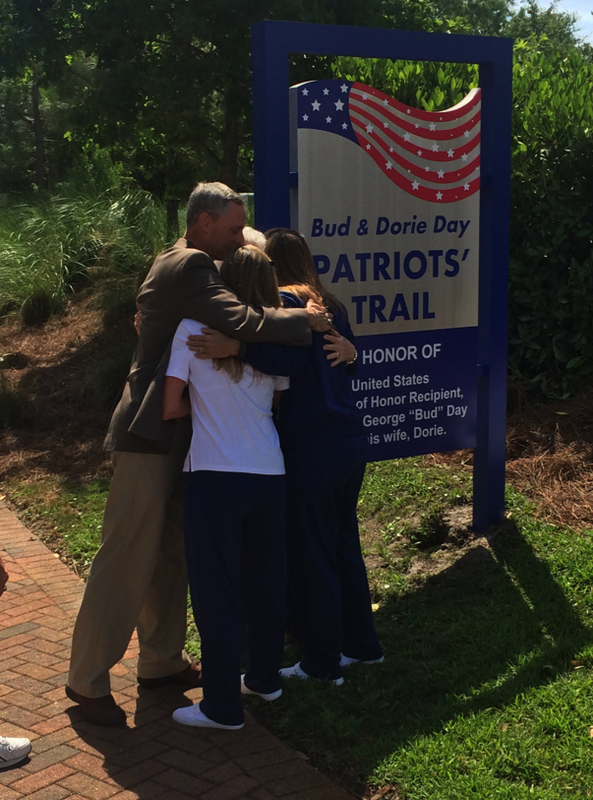 Danielle Freeman reports on the grand opening of the Bud & Dorie Day Patriot Trail in Ft. Walton Beach. The Bud and Dorie Day Patriots’ Trail is officially open in Ft. Walton Beach. The trail is named in honor of Vietnam War hero Col. Bud Day, who died in July of 2013 at the age of 88, and his wife Dorie. It winds down Staff Drive, Nebraska Avenue, and California Drive and features 16 historical markers comprised of information highlighting their life together. There’s a marker detailing Bud’s childhood, another on how he met the woman who would become the love of his life. That’s Dorie Day, she says the occasion was heartwarming yet bittersweet because it was held on what would have been their 66th wedding anniversary. The third marker along the trail highlights their courtship and their wedding in 1949. The Day family embraces next to the sign explaining the trail: Dorie Day and her children, George Day Jr. and her daughters Sandra Hearn and Sonja Lajeunesse. The Greater FWB Chamber of Commerce spearheaded the project. But, the idea behind the walking trail came from Cissy Wyninegar, a good friend of the Days and president of the Fort Walton Beach Women’s Club, which will be responsible for upkeep of the memorial garden coming soon. Later this summer, once the nearby Docie Bass recreation center is demolished, the second phase of the project will begin. A courtyard and memorial garden will be constructed and will serve as the main entry way to the Patriots' Trail. The Bud and Dorie Day Patriots' Trail will wind through a neighborhood behind Uptown Station on Eglin Parkway. The trail has been a community effort from the very start. The city of Ft. Walton Beach donated the land and the greater FWB Chamber of Commerce has taken charge of fundraising the $100,000 needed to build it. Ted Corcoran, the Chamber of Commerce President said the community was looking for a unique way to honor Bud Day who called the area home for over three decades until his death last year, "He has statues; he has airports around the country named after him. Voters across Florida are deciding if it will become the 24th state, and the first in the Southeast, to have a comprehensive medical marijuana program. In a nutshell, Amendment 2 would allow the medical use of marijuana for individuals with debilitating diseases, as determined by a licensed Florida doctor. The amendment was proposed by John Morgan, a trial attorney from Orlando. Qualifying for state and local offices in Florida closed at noon on Friday, June 20. While Gov. Rick Scott and the three Republican members of the Cabinet all drew opponents, several incumbent members of the Florida Legislature were re-elected without opposition. Two of them are in Northwest Florida. Greg Evers of Baker is headed for a second and final four-year term in the Florida Senate, representing District 2. A new non-profit organization is rallying support for legislation allowing the use of a specific type of medical marijuana. Caring 4 Florida was founded in January this year by Peyton and Holley Moseley. The not-for-profit organization is intended educate and advocate for the legalization of non-euphoric strains of cannabis for use by epilepsy patients. The Moseley’s eleven year old daughter, RayAnn, has intractable epilepsy and cerebral palsy. Uncle Sam is offering a one billion dollar compromise to Florida, regarding the Low Income Pool – which is provided to hospitals to help pay for uninsured and under-insured patients and is scheduled to expire on June 30 if not renewed. State Senator Don Gaetz made the announcement on Thursday, adding that there are a number of conditions. One is that the LIP money must follow the patient. That’s a catch he says the state has known about for some time. Gov. Rick Scott's newly created Commission on Healthcare and Hospital Funding met for the first time on Wednesday. But hospitals have met his request for information by essentially telling him to look it up himself. That includes at least one Pensacola-area facility. Many of the dozens of surveys returned by hospitals have five or fewer of the roughly 100 lines filled out with new information. Many referred Scott to data already on file with the Florida Agency for Health Care Administration. The Florida House provided a surprising twist in the Legislature’s fight over expanding Medicaid on Tuesday, by suddenly adjourning its 2015 session, that action ensures that a special session will be called to complete the budget. In his remarks, House Speaker Steve Crisafulli blamed the shutdown on the Senate's unwillingness to drop its resolve to bring up a Medicaid expansion alternative before agreeing to a budget. Marco Rubio’s decision to vacate his U.S. Senate seat in favor of a run for president in 2016 is leading speculation about the slate of candidates wanting to succeed him. Two of the possibilities are in northwest Florida.